The nickname is a slightly deranged name I’ve given to my bird–with her consequently jumping the gun on accepting my fiance’s last name as her own. Leaving her for ten days over Christmas was too nerve-wracking, so I’ve hired a ‘birdsitter.’ This birdsitter came over the other night to ‘meet Missy,’ which I thought was hilarious. Missy took this opportunity to exhibit her crazy side and flew into a few thing in my apartment, including a surprising new obstacle– the purple Christmas tree. In comes my cue…plugging in the lights. Awesome. 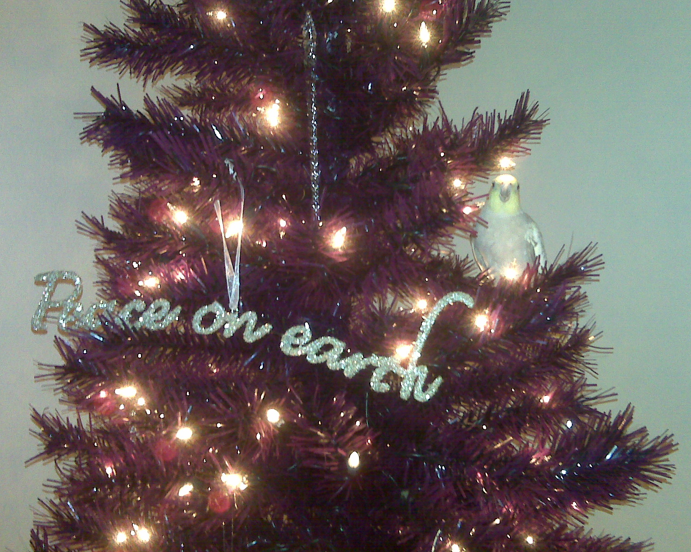 Now I have my own partridge in a pear tree. I asked the sitter if she’s ever watched a bird before…she hasn’t. Instructions for the birdsitter were as such: please feed her and give her fresh water each time you come. I am not going to close her cage (eek!) so please call me if for whatever reason you can’t find her in my apartment; I just don’t want to take her freedom. She likes broccoli and lettuce, but not nearly as much as quesadillas and Cheez-its. She poops every 15 minutes or so…here are some wipes in case you need them. I made a Christmas cookie in her honor. See the resemblance?